View test coverage reports for each class alongside other metrics like complexity, duplication, and churn. Toggle between viewing code smells and test coverage line-by-line on the same source listings (see above). 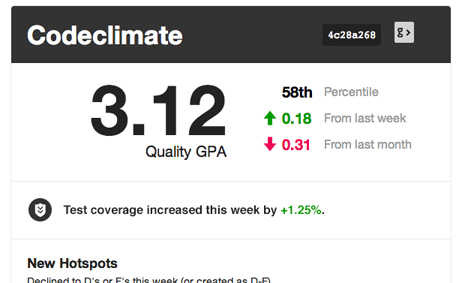 Track your team’s test coverage in your weekly summary emails and Code Climate feed. We think the addition of test coverage to our code quality offering is a powerful upgrade in our mission of helping free teams from the burden of technical debt and unmaintainable code. Give it a try today, and let us know what you think. How does test coverage work? We’ve released the codeclimate-test-reporter RubyGem that you install into your Gemfile. When your tests finish, it sends an HTTPS post to us with a report on which lines of code were executed (and how many times). Test Coverage is included in all our currently offered plans. To turn it on for a specific repo, just go to your repository’s feed page, click “Set up Test Coverage” and follow the instructions. Some of you might not have a CI server in place for your project, or perhaps you’ve been frustrated maintaining your own CI server and are looking for something better. We believe cloud-based CI is the future and are excited to partner with three fantastic CI providers – Semaphore, Solano Labs, and Travis CI – to ensure you can integrate their services with just a few clicks. All three of our partners save you from the headaches of administering a CI server (like Jenkins) on your own – time and money that adds up quickly. If you’re looking to make a move to a cloud CI vendor, now is a great time. Semaphore, Solano Labs, and Travis CI have generously agreed to provide Code Climate customers 20% off their first three months. Joining forces with three companies that are experts at running your tests – safely, quickly and with little effort – means we can stay focused on what we do best. To get started with one of these great partner offers, login to your Code Climate account and head to the Test Coverage setup tab for one of your repos.